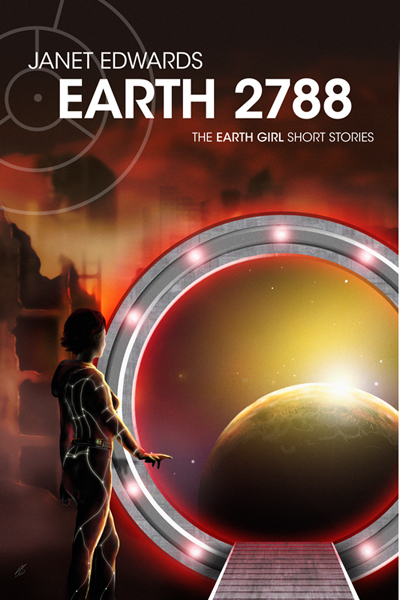 EARTH 2788 – The Earth Girl Short Stories is now available as an ebook on Kindle worldwide. In the year 2788, people use interstellar portals to travel between over a thousand colony worlds scattered across six sectors of space, each with their own contrasting cultures. On the rich worlds of Alpha sector, you aren’t considered fully adult until 25, while the frontier worlds of Epsilon sector expect a girl to marry at 17. Clan centred Beta sector is notoriously permissive, while Deltan worlds consider it shocking behaviour to kiss in public. In Kappa sector, the military battle to make new worlds safe for colonization, while Earth is a semi-abandoned ruin. Each story features one of the characters from the Earth Girl trilogy. Eight people, with eight very distinctive backgrounds and problems, all destined to get caught up in one girl’s fight for acceptance. A fight that will change Earth forever. Amazon has exclusivity rules that prevent me using some options if the stories are available elsewhere, including my own website. That means I’ve currently got EARTH 2788 set to the minimum price point for Kindle, and it isn’t included in Kindle Unlimited. You can sign up for my newsletter for updates on EARTH 2788 becoming available in other formats, a forthcoming novella, and other publication news. Remember it’s now only two months to go before the USA release of Earth Flight on 8th September 2015! This entry was posted in Uncategorized and tagged Earth Girl News, News, Short stories. Bookmark the permalink.